Sites must be modest and developed in accordance with any standards imposed by a State or local government. Therefore, the lender must verify that the following requirements are met at the time of application.  Income-Producing Buildings. The property must not include buildings designed and to be used principally for income-producing purposes. For example barns, silos, greenhouses, or livestock facilities used primarily for income producing agricultural, farming or commercial enterprise are ineligible. However, barn, silos, livestock facilities or greenhouses no longer in use for a commercial operation, used for storage, and outbuildings such as storage sheds are permitted if they are not used primarily for income producing agricultural, farming or commercial enterprise. A minimal income-producing activity, such as maintaining a garden that generates a small amount of additional income, does not violate this requirement. Home-based operations such as childcare, product sales, or craft production that do not require specific features are not restricted. A qualified property must be predominantly residential in use, character and appearance. Income-Producing Land. The site must not have income-producing land that will be used principally for income producing purposes. Vacant land or properties used primarily for agricultural, farming or commercial enterprise are ineligible. Sites that have income-producing characteristics (e.g. large tracts of arable land ready for planting) are considered income-producing property. However maintaining a garden for personal use is not in violation of this requirement. A minimal income-producing activity, such as a garden that could generate a small amount of additional income does not violate this requirement. A qualified property must be predominantly residential in use, character and appearance. Site Specifications. The site must be contiguous to and have direct access from a street, road, or driveway. Streets and roads must be hard surfaced or all weather surfaced and legally enforceable arrangements must be in place to ensure that needed maintenance will be provided. Utilities. The site must be supported by adequate utilities and water and wastewater disposal systems. The view and opinions stated on this website belong solely to the authors, and are intended for informational purposes only. The posted information does not guarantee approval, nor does it comprise full underwriting guidelines. This does not represent being part of a government agency. If the credit report on a loan with RHS approval will expire prior to loan closing, a new credit report outside of GUS can be pulled. If the new report shows no changes to credit, then the loan does not need to be resubmitted to RHS for re-approval. Assets should be calculated using the lesser of a two month average balance or the current bank statement/recent VOD. Debts omitted in GUS now require that reason for omission be listed in the “Notes” section. Military applicants are no longer required to provide evidence of pending discharge. Continuance is automatically assumed on Social Security income unless the benefit letter specifically states an expiration date. Payments for the care of foster children or adults cannot be used as income. Authorized User accounts can be used to meet tradeline requirements if 12 months payment can be documented by the borrower. 30 day accounts paid each month do not have to be included in the DTI. Judgments accounts may be excluded from the debt calculation if less than 10 months remain on the repayment plan. Charge-off accounts should not be included as a liability or a debt. Debts incurring a significant impact on repayment are now defined as being 5% or more of the gross monthly income. USDA does not have to be added to the appraisal as an intended user. Additional safety measures are required for properties in a flood zone which also use private septic & water systems. Use the greater of one percent (1%) of the outstanding loan balance or the verified fixed payment as reflected on the credit report. Income Based Repayment (IBR) plans, graduated plans, adjustable rates, interest only and deferred plans are examples of repayment plans that are subject to change. These types of repayment plans are unacceptable to represent a long term fixed payment plan. WHAT ARE THE PROPERTY REQUIREMENTS? * The property must be a single family unit or an approved condominium unit. The Agricultural Act of 2014 (Farm Bill) makes areas with population up to 35,000 and rural in character eligible for USDA Rural Housing Programs, with certain provisions. Changes to the eligible areas map based on the Farm Bill will be released on May 6, 2014, on the USDA Income and Property Eligibility Site. Select “Single Family Housing” under the Property Eligibility menu. Stakeholders are advised that additional changes to eligible rural areas for USDA Rural Housing Programs as outlined in H.R.933, Consolidated and Further Continuing Appropriations Act of 2013 and the 2010 Census will take effect on October 1, 2014, barring further Congressional action. A preview of the “Future Eligible Areas” will be available on the USDA Income and Property Eligibility Site later this summer. * Camps, existing mobile homes, and multifamily dwellings cannot be financed. * Income-producing property cannot be financed. * Homes may be new construction – stick built, modular or manufactured housing are all acceptable. WHAT ARE THE APPRAISAL AND INSPECTION REQUIREMENTS? * Standard appraisal documents are acceptable. HUD Appraiser Certifies that Property meets HUD Minimum Requirements. * Private water supplies must be tested for potability. Location: Kentucky has 120 counties, and USDA is not allowed in the following KY Counties: Jefferson, Fayette (whole county) and parts of McCracken, Boone, Kenton, Campbell, Bullitt, Daviess, Warren, Franklin and Christian counties. The best thing to do on the location is tell me an address and I can look it up for you. I have a website that is really good for USDA loans, located at http://kentuckyruralhousingusdaloan.blogspot.com/p/usda-rural-housing-loan-program.html that may assist and educate you about the program. In order to get you pre-approved, I will need the following items from you. This is a free process and I will give you a copy of your credit report for free. I don’t need originals, copies are fine. You can fax, email, or drop off at my office below . 1 What is the guarantee? 2 What is the advantage to the customer? 100 percent financing, fixed interest rate, low monthly mi fee (.50bps) and upfront mi fee of 2% and no restrictions on size or design are just a few of the advantages. 3 What are the eligibility requirements? 4 Can a Broker originate Guaranteed loans? Yes, however only Approved lenders may underwrite & submit loans. 5 How long does it take to get an answer? number of guarantee requests received. 6 What is the maximum fixed Interest Rate and term? with no discount points. The term is 30 years. 7 What is the maximum loan amount? The Loan amount is limited by the market value and repayment ability. 8 What is the maximum Loan to Value? It can be up to 100% LTV plus the Agency guarantee fee. 9 What is the Guarantee Fee? The guarantee fee is 2.0 percent of the “Total” loan amount. 10 What are the qualifying ratios? PITI Ratio 29 percent, TD Ratio 41 percent. Higher ratios may be approved with compensating factors. 11 Do we show deferred student loans in the debt ratio? Loans regardless of the deferment period. 12 What is the minimum credit score? Under certain criteria, credit score 640 and above no comment required. guaranteed for applicants who have a middle credit score of 580 & below. 14 What about refinancing? 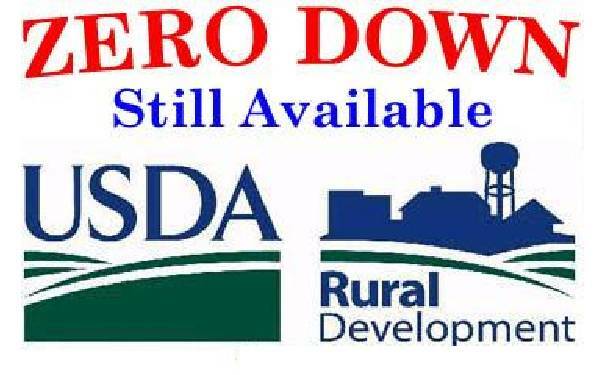 Limited to existing USDA Rural Development guaranteed or direct loans. 15 Can loans include acreage? acreage may not exceed of the total property value. 18 What are the required inspections?Property must meet HUD Handbook 4905.1 & 4150.2 or similar standard. A FHA roster appraiser can verify adequacy/working order of electrical, plumbing, heating, water & waste disposal on existing dwellings. 19 Will USDA Rural Development issue a letter asking the Approved Lender to make a loan? No. This is the Approved Lender‟s loan. They underwrite the loan and decide if it meets their standards and Agency standards before submitting. 20 Is homebuyer education required? Homebuyer education is not required, however it is recommended. 22 Who approves the Appraiser? The appraiser must be licensed by the State to complete appraisals. 23 Can necessary repairs be included in loan? Yes. An „as improved‟ appraisal will be needed to include cost of repairs. years, and telephone verification of employment. 25 Who buys Guaranteed Housing Loans?